While summer could not come early enough this year thanks to a rather rainy spring, these days I long for the cool and crisp days of autumn, and autumn is certainly dragging its heels a bit around these parts. Or maybe, after a mere year of living in Rome, I still have this false notion of what autumn in Rome should look like, expecting to wake up to storm clouds, dark grey skies, and weather that makes you wrap up in several layers ending with a trench coat and a scarf wrapped tightly around your neck to make sure none of that icy wind gets in, the type of autumn days I grew up with and continued to love/hate in my 10 plus years of living in the UK. But really, I should know better by now. When I first moved here last November, the days were still so warm I barely made it to the office without taking off my cardigan or blazer. And lunch breaks inevitably involved a trip to the nearest gelateria, every single tripe justified through knowing that this very day could be the last day of ‘ice cream weather’ before the weather would become too cold for ice cream. Either way, it is now November, which means it is definitely autumn, even if my internal barometer seems to think otherwise. And with winter not far too off and my fridge currently housing a ginormous pumpkin courtesy of Alessandro’s mum, I decided it was most definitely time for pumpkin cake. I used my trusted carrot cake recipe but made things a little lighter by swapping some of the oil for yoghurt. I also dialled down the cinnamon and used a good dose of garam masala and tumeric – the tumeric is here purely for its gorgeous yellow colour (although at this time of year it does not hurt that it has great anti-inflammatory properties too) and the garam masala is my new favourite way of adding warmth and spice to cakes without having everything taste of gingerbread and the bog standard pumpkin or gingerbread spice mixes. 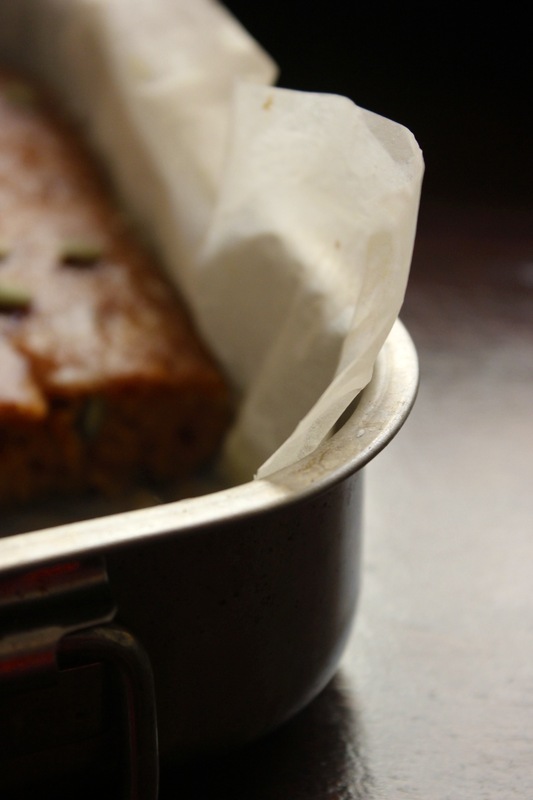 Note: I baked this as a tray bake using a gratin pan – to fill a normal sheet pan, you will need to double the recipe and the cake might need an extra 5-10 minutes in the oven, keep an eye on it though. 1. Pre-heat the oven to 175 degrees Celsius and line a gratin pan with parchment paper. 2. Using an electric mixer beat the eggs while slowly trickling in the oil. Once all the oil has been incorporated, whisk in the yoghurt, the sugar and the grated pumpkin. 3. 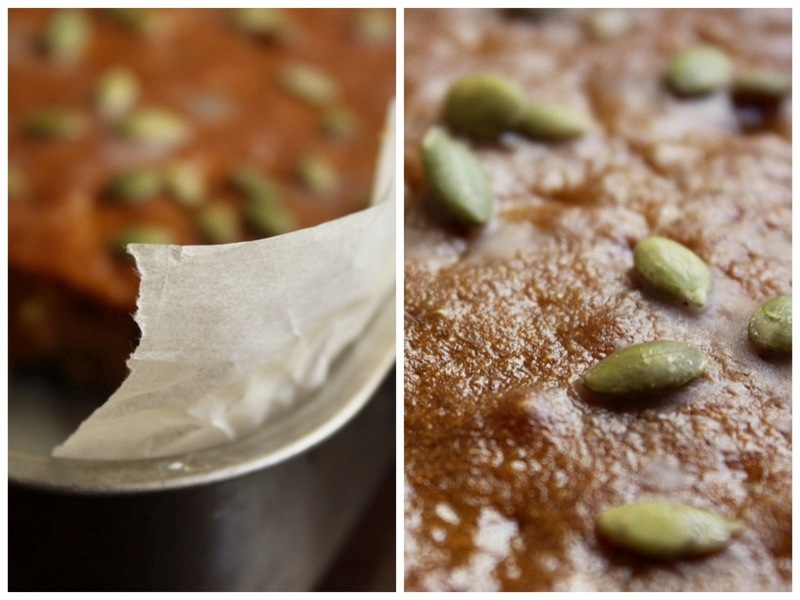 In a separate bowl whisk the baking powder, baking soda, salt and spices into the flour before dumping this onto the wet ingredients together with the pumpkin seeds and stirring everything quickly together. 4. Pour the batter into the prepared pan and place in the oven for 25-30 minutes or until the cake is golden brown and no crumbs stick to a skewer inserted into the middle of the pan. 5. While the cake is cooling, whisk the icing sugar with 1-2 tbsp of milk and spread the glaze over the warm cake with a pastry brush. 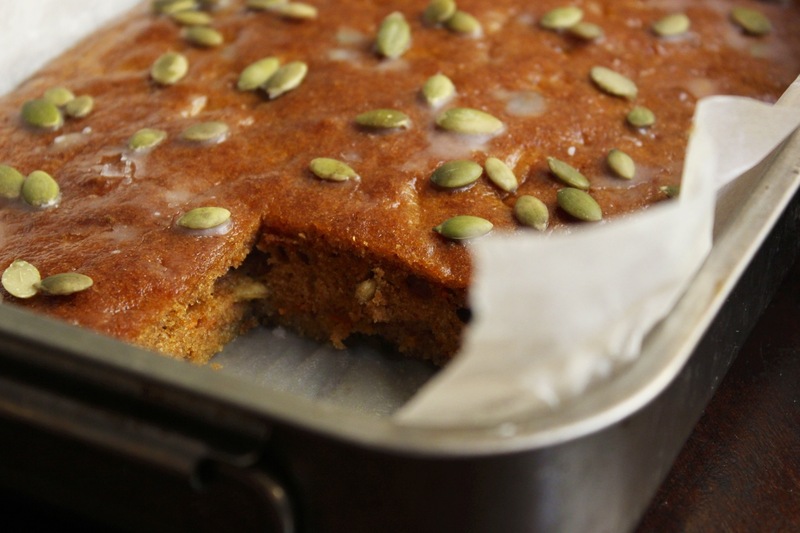 If you want, you can scatter pumpkin seeds over the glaze. Thank you, I am really happy with the flavours. I can definitely eat gelato all year round (and certainly do!) although it’s much more fun eating it while walking in the sunshine than wrapped up warm! It’s never too cold for ice cream, especially in Rome 🙂 Curious how different upbringings foster different mindsets: even after three years, I still expect the British autumn to come with those Italian blue skies, and can’t seem to get used to all this grey. 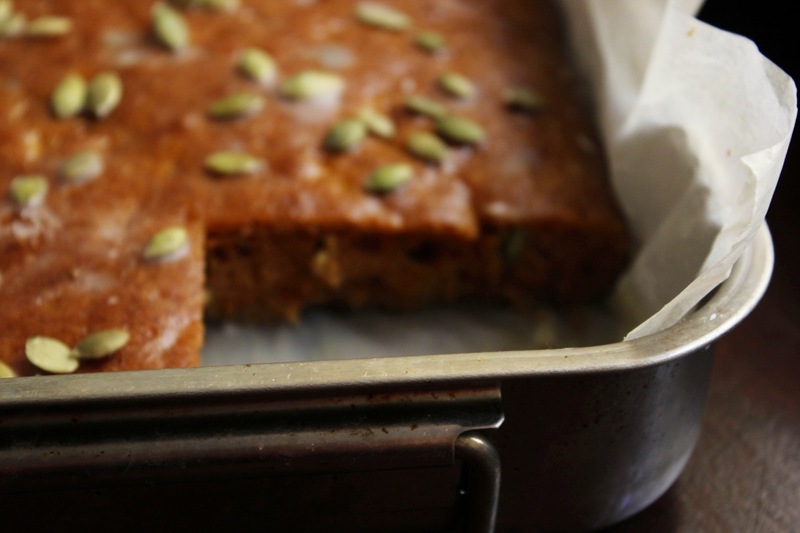 And who’d have thought garam masala and turmeric work well in cakes? I normally associate them to curries and savoury dishes, but your recipe looks tempting enough to make me want to try! Very true about the ice cream although I find it more enjoyable to eat gelato when it’s warm outside! It is funny how influenced we are by our upbringing – my boyfriend finds it weird that I miss the cold and rainy autumn days of London/Germany (and in all honesty, my mum who really should have been born in a warm country for her insatiable thirst for sunshine, can’t really understand me either). And I must agree – it sounds a bit odd. But I guess, however great the weather is here in Rome, every once in a while I just miss home!